Digital clocks aren't just for telling time anymore. Your clock is a much a statement of style as it is a functional timepiece, and Alarm Clocks Online has all your digital clock needs covered! Whether you're looking for a new addition to your home decor, a gift for friends or relatives, or just an upgrade from your old analog wake-up call, the top-quality digital clocks we offer fit every need. Each clock from our extensive selection offers a unique set of features to fit your 21st century lifestyle, and at prices that will make us your new online home for every timekeeping need. 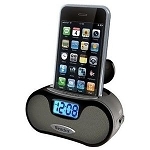 Do you travel often and need a reliable yet elegant clock that's at home on the road or in your bedroom? 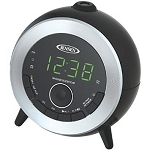 Take a look at the easy to carry Onyx Travel Alarm Clock by Westclox that only requires a single AA battery. Want something that shows off your style while providing incredibly accurate time you never even have to set? Then you have to see the Atomic Projection Alarm Clock by Equity that sets itself as soon as you turn it on and keeps the cool train going by projecting the time on your wall or ceiling. 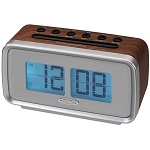 We even offer digital clocks that will charge your mobile phone or tablet while you sleep, and others that help you get ready for your day by keeping track of the date and temperature. We know you need a digital clock that fits your life, and that's exactly why we offer such a diverse selection of high quality timepieces for every need and budget. After you've made your purchase, don't forget to sign up for our e-newsletter so we can keep you up to date with all the latest sales and new selections we have to offer. Be on time, be cool and remember that at Alarm Clocks Online - We Know Alarm Clocks!